Leung Kei-cheuk, aka GayBird. Born and educated in Hong Kong, and he was graduated from the Hong Kong Academy for Performing Arts with a master degree (music composition and electro-acoustic music) and Hong Kong City University with Master of Philosophy (creative media). Since 1996, he has started working in the Hong Kong music industry as music director, composer and producer for over a hundred of music productions, concerts and theatres. His works have been nominated or awarded in Asian Composer League music Competition, CASH Golden Sail Music Award, Hong Kong Film Award, Taiwan Golden House Film Award and TVB Music Award, etc. GayBird is a core member of PMPS Music, a cutting-edge production unit in blending alternative cultures with contemporary music, and dedicated in expanding vocabularies in the mainstream music industry. In his own music development, he has also formed an electronic group – Multiplex and published the debut album, Snow in June as early as in 1995, with music across neoclassical to electronic. He later returned to focus on his personal music exploration, and delved into the sonic terrain of analogue synthesizers that opened up to him, and resulted with the album Made by Gaybird published in 2002. In recent years, he not only continues exploring in the realm of music creation, he started to investigate on potentials and formats of electronic music performance, on ways in making it more performative and lively, in order to enhance music experience to audience. This simple aim has motivated GayBird to study in new media art. He has received the Hong Kong City University Research Tuition Scholarship, and obtained Master of Philosophy at the City University of Hong Kong in 2011, specializing his research and creation in human control interface design, new media art and the interactivity of live music performance with application of media technology. He created Digital Hug in 2011 and CouCou on Mars in 2013 and successfully brought up a new media music experiment. 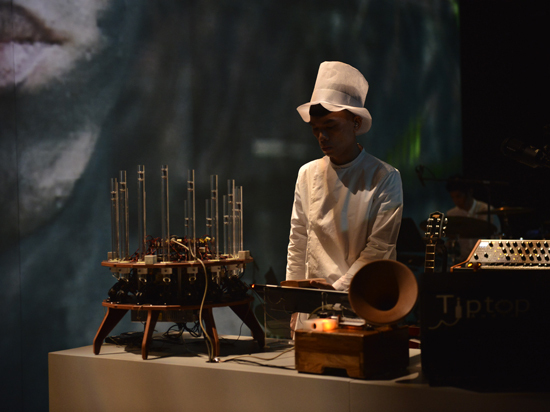 Both productions were awarded in Hong Kong Design Award 2011 Bronze Award for new media experiment/performance, best Electronic Music Artist at the Chinese Music Media Awards 2012 and 2014 and Ten Outstanding Designers 2014. Both works were toured in festival all around the world. The new visual music performance “One Zero” was more forward to explore the boundary between theatre, exhibition and live performance. The work use theatre space, media installation, surrounds sound system, video and live music as the elements. All the video visual was create by award winning director Tsai Ming-Liang. Hong Kong New Vision Festival commissioned this work, and world premiere at 2016 in Hong Kong. Apart from new media instrument, music composition and performance, he also creates sound installations. In 2015, he collaborated with a few Hong Kong artists, and successfully brought up a large scale exhibition “Touch Wood”. The exhibition was exhibit at K11 art space for 2 months. His other sound installation also exhibiting in different art festival, such as EXIT Fesitval 2013 (Pairs), Technology Art Festival 2015 (Taipei), Detour 2015 (HK) and Digital Art Festival 2016 (Athens) etc. With his broad experience across different spheres, GayBird’s works beyond music just for listening, but a cohesive work combining visuals, mechanism, programming, craftsmanship and installation art, that could offer a comprehensive music experience.